Don't try this if you don't know what you are doing. Take the necessary precautions and proceed at your own risk. ;) Better to have a professional fix your tire, but it's good information to know in an emergency. In a nutshell, you spray something like starter fluid, hairspray, or WD-40 into the tire, ignite it, and then put air in the tire right away to keep it sealed. I used hairspray since I didn't have starter fluid, which is what many people use to do this with; but apparently, there are different things you can use. You can do a search for more information. I personally wouldn't recommend lighting the spray from the can on fire like the video above. The tire I sealed was very small, and I used a very long 11-inch match. You can use a blowtorch or something else to give you some distance from the tire. Better to start with a little spray and have it not seal on the first attempt than to put too much in the first time you try this and have a bigger than necessary reaction. Obviously, don't try it on or near flammable things. Update: My friend Bob says "if you ever do that in warm weather, a mixture of about 5 to 1 of water and dish soap will help lubricate the tire bead to get it to seat and seal better." Tire bead is the term for the edge of a tire that sits on the wheel. Wheels for automobiles, bicycles, etc. are made with a small slot or groove for the tire bead to sit in. When the tire is properly inflated the air pressure within the tire keeps the bead in this groove. 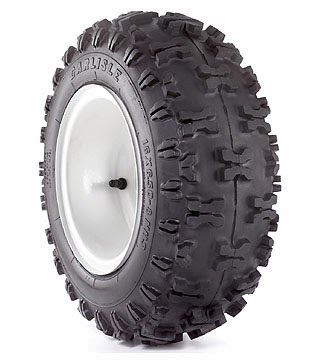 When putting a new tire on a wheel, there is the problem of sealing or setting the bead; the tire will not inflate if the incoming air can escape. Some people spray starter fluid or WD-40 into the tire and then light it to set the bead. Thanks for checking out my blog post.